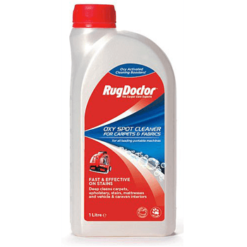 Our range of professional carpet and upholstery detergents are designed for use with a Rug Doctor carpet cleaner. 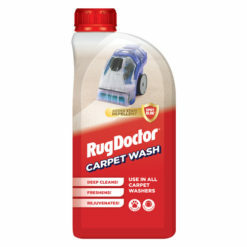 Refresh and revitalise tired looking carpets, leaving them plush and smelling fresh. 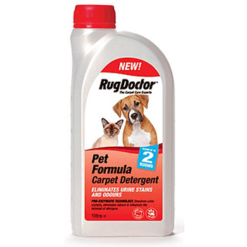 Our Pet Formula Carpet Detergent is perfect for those little accidents – the effective cleaning action removes urine stains and odours! The Oxy Spot Cleaner is designed for use with the Portable Spot Cleaner, your number one solution to nightmare stain emergencies. 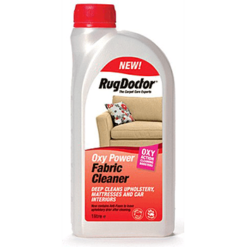 With Rug Doctor Oxy Power Fabric Cleaner, you’ll get the cleaning power needed for your upholstery and fabrics. Get fantastic cleaning results on your car or caravan interior, and you can even use it to deep clean upholstery and mattresses. This specially formulated Carpet Wash, with added SpotBlok®, is for use in all brands of carpet washers. 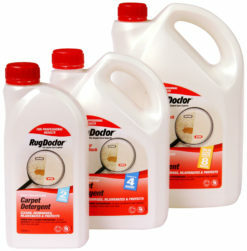 It's perfect for cleaning and adding protection against future spills on carpets and upholstery.